GALION — A new two-story press box with roof access atop the home-side stands at Unckrich Stadium in Heise Park is now officially open. The much needed press box is one of the many upgrades going on throughout Heise Park this year. 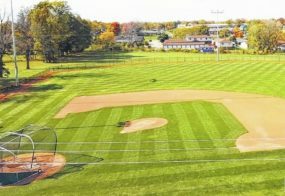 The baseball and softball fields have seen some work so far this season and the revamped fields continue to get a facelift, making these playing surfaces a desired destination for competition. The box is 499 square feet and came pre-fabricated. It was set into place by Finnegan Construction and put into place with heavy duty cranes. The project was originally going to take up much more than the current square footage, but that would have required the installation of an elevator per the Americans with Disabilities Act of 1990. Felty & Heinlen were the architects assigned to the design portion of the project. “An elevator would not work with the budget,” said Galion District Schools superintendent Jim Grubbs. The project was made possible by funding from the Egbert M. Freese Foundation and the Galion City School District Board of Education. In total, the press box cost $227,000. Because of the addition of the press box, concession improvements were put on hold. Fox Plumbing took care of the plumbing required for the improvements. Weithman Brothers Construction handled the demolition of the old press box and handled the structural aspects associated with the project. The audio system in the new box was done by Kahl’s Sound and Carter Electric worked the electrical portion of the press box. Boring was completed by Mid-Ohio Pipeline. The press box will serve the sports teams of Galion, as well as the community. It can be used for all football games and band events within Heise Park. Multiple radio, television, internet and news reporters will have access to all three levels of the new box. Due to it’s height and position, it can be used for baseball activities at the park, as well as track and field events. The box also will be able to be utilized for playoff events, the Pickle Run Festival and the Special Olympics events that have previously been held within the park. “I can’t wait to sit up on the roof and take in a baseball game,” Galion athletics director Kyle Baughn.